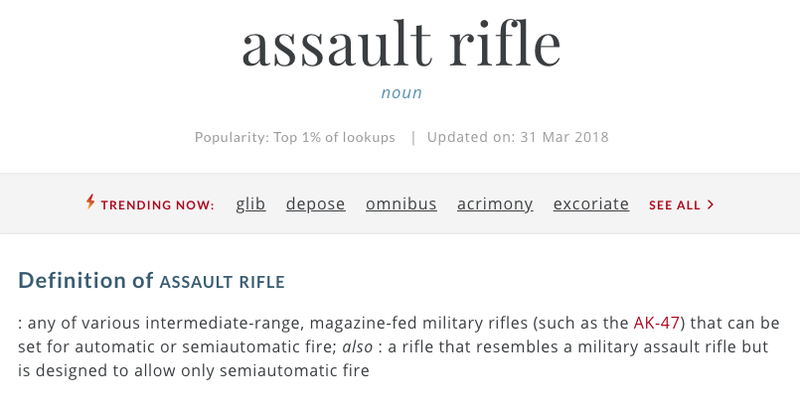 The Merriam-Webster’s online dictionary gave the “assault rifle” a new meaning on March 31. Public outcry has widened the gun control gap, and activists who support gun control have a tendency to swap the terms automatic or semiautomatic rifles with “assault weapons” and “assault rifles,” which are much more intimidating terms. There is a difference between an automatic or semiautomatic rifle and an assault weapon. In 1994, assault weapons were banned from civilian use. This law included semiautomatic rifles only when they featured a detachable magazine, a collapsible stock, a pistol grip, a bayonet mount, a flash suppressor or a grenade launcher, according to the Federalist. “’Military-style’ means it looks black and scary. Either something is an assault rifle — a military-issue rifle capable of select fire– or it’s not, and if it’s not, it’s not ‘military style,’” said Sean Davis, the co-founder of The Federalist. The term “assault rifle” originated from the Germans during World War II, and the rifles were labeled as military weapons. They offered both semiautomatic and full-automatic fire. This is no longer the case.